Jordan's King Abdullah has warned that three civil wars could break out in the Middle East unless the international community takes urgent action. Speaking on US TV, he said conflicts in Lebanon, Iraq and the Palestinian territories could spin out of control. King Abdullah is this week hosting both the US president and the Iraqi prime minister for talks against a backdrop of escalating violence in Iraq. The issue will also feature when the Iraqi president visits Iran on Monday. The trip was due to take place at the weekend, but was delayed due to the curfew imposed in Baghdad after a series of deadly car bombings last week - the bloodiest attacks since the US-led invasion of 2003. Pedestrians were allowed back on to the streets of the Iraqi capital on Sunday and the ban on vehicles was lifted on Monday morning. 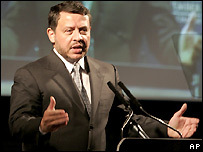 "We could possibly imagine going into 2007 and having three civil wars on our hands," King Abdullah told ABC television. "It is time that we really take a strong step forward as part of the international community and make sure we avert the Middle East from a tremendous crisis that I fear and I see could possibly happen in 2007." King Abdullah said the central issue in the region remained the Israeli-Palestinian conflict. "Palestine is the core," he said. "It is linked to the extent of what's going on in Iraq." "It is linked to what's going on in Lebanon. It is linked to the issues that we find ourselves with the Syrians. So, if you want to do comprehensive - comprehensive means bringing all the parties of the region together." A ceasefire between Palestinian militant groups and the Israeli military is currently in place in Gaza. Under the deal, which came into effect on Sunday, militant groups have promised to end rocket attacks and Israel has agreed to halt hostilities. But three rockets were fired into Israel after the ceasefire began and Israel, while pledging restraint, has also warned that military operations in Gaza will resume if the rockets do not stop. And on Monday in the West Bank a Palestinian militant and a woman were killed in an Israeli operation, Israeli and Palestinian officials said. 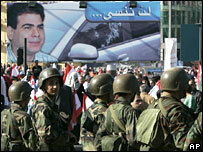 In Lebanon, tensions between pro- and anti-Syrian groups in parliament have also escalated following the killing on Tuesday of Industry Minister Pierre Gemayel. Many Lebanese accuse Damascus of orchestrating the murder of the 34-year-old Maronite Christian politician, although Syria explicitly denies any involvement. King Abdullah will host US President George W Bush and Iraqi Prime Minister Nouri Maliki in Amman later this week. He said the US should look at the big picture in seeking a resolution to the problems in Iraq and bring in all of the region, including Syria and Iran. He said if a regional peace process did not develop soon, "there won't be anything to talk about". Pressure is growing on the Bush administration to include Iran and Syria in helping curb the violence in neighbouring Iraq. Iraqi President Jalal Talabani is heading for Tehran on Monday for talks aimed at securing Tehran's aid in calming the sectarian violence. Last week there was talk of a summit convened by Iran to discuss Iraq involving the presidents of Syria, Iraq and Iran, says the BBC's Frances Harrison in Teheran. This was an idea which caused huge interest because of US suggestions that it might be time to have direct talks with Iran and Syria on Iraq. But such talks look unlikely now, our correspondent adds. On Sunday, Iranian President Mahmoud Ahmadinejad said his government would be prepared to assist if the US stops "bullying" Tehran, which rejects Washington's allegations that it is seeking to build nuclear weapons.